I’m reposting this to my blog (I hope thats ok with The Little Soap Box!) because I’ve been following her for a little while now and I’m loving what she writes! This one in particular is recipes for scrubs and foot soaks perfect for my tired feet after all the walking I’ve been doing recently! Head over and check out The Little Soap Box and I hope you enjoy their blog as much as I do! Last week we brought you the best of the bunch when it comes to super foods now that we’re edging into Autumn, and this week we’re talking about getting your toes ready for cooler weather too. It’s time to wave goodbye to your open toe sandals and flip flops; now we need boots and shoes that are going to keep our feet warm and dry! So while we look forward to months of snuggling up in thick socks, what happens to our feet beneath it all? Yes they’re cosy, but they’re also poorly ventilated and this can make them dry and itchy- not good. 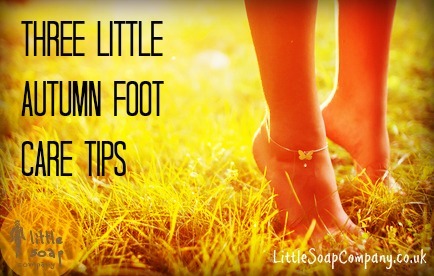 So here are three little Autumn foot care tips to take you right through to Winter and beyond.